So what exactly is ovulation? Ovulation is the release of a ripe fertile egg from the ovary, it is a womans peak time of fertility in the month. The physiological journey that a womans body goes through every cycle to achieve ovulation is the product of a series of hormones that lead into one another. This article is intended to shed light on the hormones behind ovulation in a way that any of us could understand. The information in this article will first cover the full function of the glands and organs involved in ovulation so there is groundwork for understanding the overall sequence of events which will be covered at the bottom of this article. If you already have an understanding of anatomy and physiology feel free to skip to the bottom of these writings. The act of ovulation and menstruation are the result of a hormonal dance between the Hypothalamus (master gland), the pituitary gland, ovaries, and uterus. A fresh cycle begins with the first day of a womans bleed. The bleed causes estrogen and progesterone levels to fall and the Hypothalamus begins to work. The Hypothalamus is a gland and portion of the brain located above the pituitary gland. * It controls many physiologic mechanisms including: appetite, thirst, emotional reactions, and temperature. * At menarche (first period) and throughout the reproductive life of the woman, the hypothalamus stimulates the pituitary to produce both follicle stimulating hormone (FSH) and luteinizing hormone (LH), which in turn causes the menstrual cycle to occur. * Hormones are chemical messengers that are produced in one part of the body, travel through the blood stream, and affect other parts of the body. * The hypothalamus is influenced by our environment and emotional state and acts as a major computer in our body analyzing signals from other areas of the brain as well as hormonal signals. 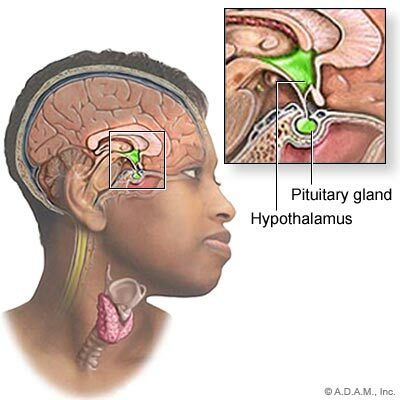 The Pituitary is a gland is an endocrine gland about the size of a pea and weighs less than 0.02oz. It is a protrusion off of the bottom of the hypothalamus at the base of the brain. * The anterior lobe of the pituitary gland secrets FSH and LH that in turn stimulate the ovaries to mature and release ova (egg(s)). There is a feed back mechanism between the ovaries and the hypothalamus which increases or decreases the amount of FSH and LH produced in the pituitary. The pituitary gland also secretes prolactin to stimulate the production of breast milk. 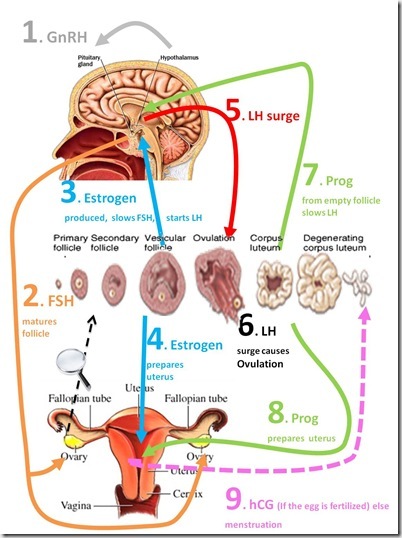 Follicle Stimulating Hormone (FSH): is stimulated into production at the beginning of the cycle, because of the decrease in the ovarian hormones, estrogen and progesterone production at the end of the previous cycle. FSH stimulates several of the most sensitive follicles in the ovary to begin growing. * The level of FSH fluctuates and must reach a threshold level before any follicular growth takes place. * Several days of follicle growth are required before the follicles secrete enough estrogen into the blood stream to signal the hypothalamus/pituitary that the threshold for FSH has been reached. * There is an intermediate level of FSH which must be exceeded before the dominate follicle is boosted into its full ovulatory response. * There is also a maximum level of FSH, only 20-30% above the threshold which must not be exceeded, otherwise too many follicles would develop and multiple ovulations would occur. 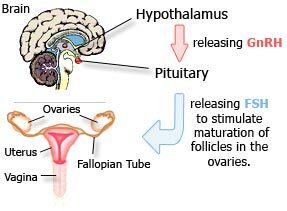 * The drop in FSH after the intermediate level is reached causes the follicle to be receptive to the secondary pituitary hormone, LH which will surge before ovulation. * Usually only one follicle is boosted to ovulation. 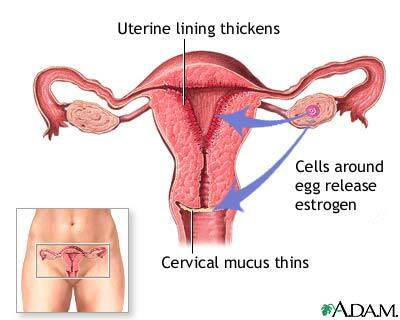 Luteinizing Hormone (LH) Stimulates certain cells that line the follicle (theca interna cells) to produce progesterone. The LH levels surge prior to ovulation and cause the egg to be ruptured from the follicle. Luteinization causes formation of corpus luteum from the ruptured follicle. Progesterone and estrogen are secreted by the corpus luteum. The corpus luteum (yellow body) is formed from the ruptured follicle and functions for 11-16 days in the absence of pregnancy. *The corpus luteum produces progesterone and estrogen. Ovaries: Under the influence of FSH and LH the ova mature and are released from a cyst like structure called the follicle. Usually only one follicle reaches maturity and releases an ovum at ovulation. 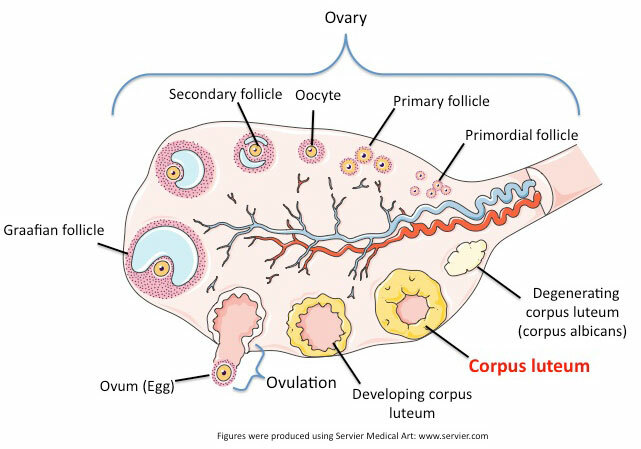 Following ovulation, the ruptured follicle collapses and becomes the corpus luteum. At birth, the ovaries contain about 500,000 eggs but during a womans reproductive life only about 500 ova will ever come to maturity. * Folliculogenesis (maturation of the ova) takes 85 days. * FSH and LH, act as synergistis – cause the growth and development of follicles containing the ova and stimulate the production of estrogen. * Is the predominant ovarian hormone before ovulation. * Stimulate the growth and development of the reproductive organs prior to menarche (first period). * Causes the cervix to soften, open and rise. * Through the influence of LH certain (granulose) cells in the collapsed follicle now begin to produce progesterone and estrogen. * Progesterone is the dominate ovarian hormone after ovulation. * Progesterone acts on the endometrium to stimulate the glands to produce fluids, which will nutritionally support a new human being. With that groundwork laid we can now understand the sequence of events that take place to make ovulation occur. Credit for the research goes to WOOMB (World Organization of the Ovulation Method – Billings).